This is a Kraft card base, size 5 x 6-1/2". The plaid paper has been in my stash for a long time, so I'm guessing it is DCWV. Brown, cream, and tan cardstock. The coffee cups are from Love You a Latte cut at 4-1/4". The mat is from Elegant Edges cut at 4-3/4". I used some burlap for the middle bands. So did you catch all my doubles? I finished the inside, but no sentiment as I'm not sure how I want to use the card yet. Be sure to check out all the wonderful inspiration from the other Design Team Divas. You'll have one week to create your card, layout or altered project following this week's theme. 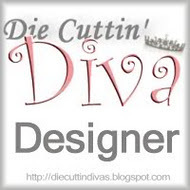 Please remember to tell us what die-cut you used and link your post back to the Die Cuttin' Divas blog site. We hope you'll join in the challenge this week; we can't wait to see what you create! Thanks for stopping by, and I hope you come back again soon. A great project. Love the embossing on the cups. Awesome card!! LOVE all the doubles!!! Fabulous card Pat and what a fun challenge, I may just have to join it:) Thank you for stopping by today my friend!! What a fabulous card! I love the embossing! Have a great day. This is a really cute card. Thanks for playing at HIMCR. love the embossing on the cups! Fabulous card! The embossing really pops and I love the fun sentiment! Nicely done my friend! Fabulous blend! I can picture drinking a hot cocoa with my hubby.